Anger is a powerful emotion. For some, it is a vile feeling that is best kept under close guard or, better yet, buried deep within one's own heart. To the Dreadnought, anger is a sacred emotion, a powerful force that serves as a catalyst to the tremendous power only he can muster. A Dreadnought is a mighty berserker who channels his anger and rage, turning the potent emotions into unearthly powers that none but another of his kind understands. When a Dreadnought becomes enraged, his body grows bigger and tougher, and the angrier he gets the stronger he becomes. Because of this, a Dreadnought seldom relies on heavy armor for protection and never wears tight garments. 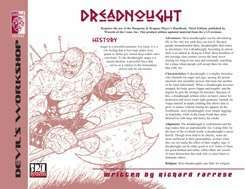 This four page Dreadnought Prestige Class PDF is an easy-to-integrate PC class and just the sort of thing needed for DMs to add depth to any great d20 fantasy campaign world and gaming session.